Beautiful Boracay Island in the Philippines (located in Aklan, Visayas) will never cease to amaze many vacationers, especially honeymooners, because of its endowment with white sandy beaches, crystal clear turquoise/blue-green water, lush landscape, thrilling nightlife, mostly warm sunny weather, captivating water activities, mouthwatering dinners, etc. #1 - Shangri-La’s Boracay Resort & Spa: On top of Shangri-La’s Boracay Resort & Spa’s super comfortable and luxurious rooms, newlyweds as well as couples of all ages will revel in Rima’s delish dinner menu, all set to put lovers in the most romantic mood, what with a tree top setting perfect for chilling while dining! As if this form of celebration and relaxation is not enough, this stunning hotel also offers water sports, events venues as well as total body and soul rejuvenation at CHI, The spa – where couples can whoop it up with their exceptional massage. Divine! #2 - Discovery Shores Boracay: currently provides couples with a great honeymoon package with no worries – it’s called Beach Bliss, because it’s packed with ultimate delights such as a 3-day/2-night sweet suite stay for two, daily scrumptious breakfast buffet, a very memorable tasty lunch at famous Sands Restaurant by the sea, a chance to either skim board or paddle surf, etc. 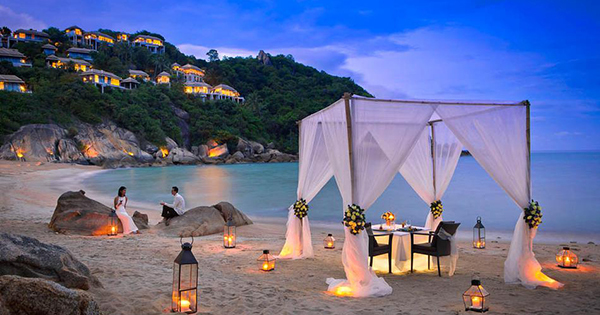 So inviting, couples might wish to just stay here for life! #3 - Jony’s Beach Resort: Have awesome dining with your spouse in al fresco Maya’s Filipino and Mexican Cuisine – the pride of Jony’s Beach Resort! Relish a together forever with their Tacos Baja, Grilled Chicken Quesadilla, Roast Suckling Pig Asado Burrito, and many more palatable dishes to savor. Moreover, Jony’s Beach Resort is situated in serene Station 1, which is just a stone’s throw away to Station 2, where powdery white sand, wonderful sunsets/sunshine, water sports, thrilling nightlife, shops, bars and more restaurants combine for your excellent honeymoon memories to last a lifetime! #4 - The District Boracay: Dine in style as a couple like nothing else matters at Star Lounge, in The District Boracay – which serves the best brunch buffet, with their sumptuous Filipino and international dishes; not to mention, this 5 – star hotel also features a roof deck bar and lounge area for an evening of cocktails, local beers and bonding of lovers in addition to people from all walks of life. What is more, remarkable rooms, friendly staff, a beach-side setting plus the cool breeze of unpolluted air – all match to satisfy you the max! #5 - Two Seasons Boracay Resort: Have no reservations and lavish your love for your better half at world-class Two Seasons Boracay Resort! To tell you the truth, what better way to share some loving while relaxing is there than checking into this great resort’s exemplary Suite Heaven and having luscious Four-Cheese Pizza together with Oyster Sisig next to cold beers or cocktails over at barLO Resto Lounge? After which, you can hold hands while walking by Boracay’s shores as well as bask in the warm sunshine or cool dusk as you reminisce together on the powdery white sand, so famous in this island, etc.